I love earrings, short or long, big or small, I like them all. I love rings; the bigger, the better. I love bracelets; charms are my favorite, but I am loving the new acrylic one. I love necklaces; I like long ones so I can layer them. I love earlaces; I have yet to wear mines. My favorite piece of jewelry has to be my wedding ring. 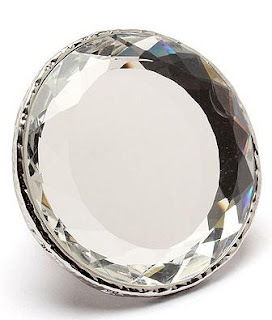 it is a ring with an actually mirror on it. Who would not love wearing a functional piece of jewelry?